For All Our Peanut Butter Fanatics! OMG Peanut Butter Booty!! Did we really do it, yes we did because after all Peanut Butter Makes The Booty Grow, So Don't Be Jelly Of My Peanut Butter Booty!! This amazing creation is the brainchild of LiveSore Athlete Meredith Burns and her love for Peanut Butter! There is simply no way you can't have fun with this crazy shirt and it is a MUST HAVE, not to mention everyone will want to know where you got it!! 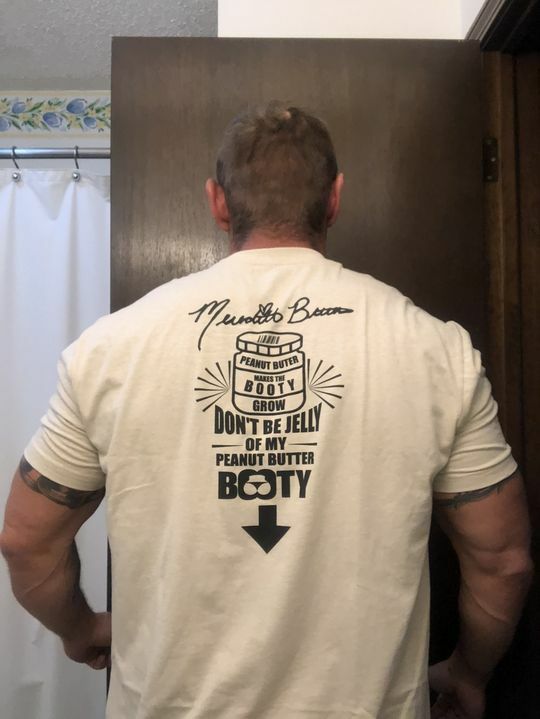 Show off your the pride in your Peanut Butter Booty & rock this like a boss!! Garry B. Reviewed by Garry B.
Robert K. Reviewed by Robert K.
My wife thinks it's hilarious, and is thoroughly embarrassed when I where it outside of the gym. Samantha W. Reviewed by Samantha W.
Jason J. Reviewed by Jason J.